Have you been in a slump lately? Maybe you’ve just been feeling down, as we all do from time to time. Or maybe you’ve been struggling with anxiety or depression. Perhaps life has been busy and you’ve been experiencing a lot of stress, or maybe you’ve hit some rough times and it’s been getting under your skin. Research has shown that serotonin levels may actually increase during meditation. As serotonin is a neurotransmitter that makes us feel content, happy and even euphoric, it follows that a single session of meditation can bring about these feelings of happiness. If you meditate regularly, your serotonin levels may elevate more and stay elevated for longer. When your serotonin levels are up, it can be much easier to smile and enjoy life! One of the best-known benefits of meditation is its ability to relieve all sorts of stress. Meditating when you’re in the midst of a stressful situation can give you distance, perspective and breathing room from the situation — a mental reset, if you will. Meditating regularly can do wonders in relieving chronic stress, which if left unchecked can be very dangerous to your physical and mental health. As an overabundance of stress is a common undercurrent to unhappiness and discontentment, relieving yours is a great way to let your happiness shine through. Think of it as clearing the fog; meditation allows you to see the sun more brightly. When your mind is dwelling in the past or ruminating on the future, it can lead to a lot of unhappiness. The past has already happened and the future is always uncertain no matter how many plans you put into place. The place where life happens, and happiness occurs, is in the present. When you meditate, you learn to bring your mind into the present and center yourself in the moment. When you free yourself from worries of the past and future and accept the present moment for exactly what it is, you give yourself the opportunity to enjoy it. If your mind is always wandering away, it’s impossible to enjoy the moment you are in. Regularly meditating is a way to train your mind to stay present, so that you can experience the joy of now. When you actively manage your stress and get your mind centered in the present moment, you can do a world of good for not only yourself but for all of your relationships as well. You’ll find yourself connecting more openly and in a more relaxed manner with your loved ones. When you slow your mind down, it’s also easier to listen and simply enjoy time with others, without stress and wandering thoughts dragging you away. If you have children, meditating can also help you to be more patient and joyful in your interactions with them. Children naturally do many things to test their parents’ patience. If you are a parent, chances are your mind could use all the centering it can get! Along with relieving stress, a body of research has shown that meditation can help to reduce both anxiety and depression. For just a couple of examples, a 2004 study published in the journal Cognitive Therapy and Research found that Mindfulness Meditation reduced instances of “ruminative thinking,” thus potentially mitigating certain symptoms of depression. 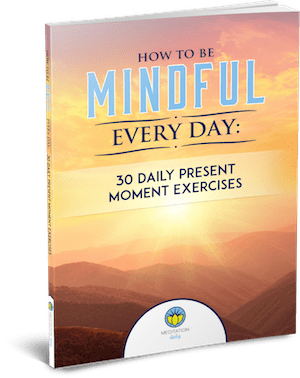 Another study, published in 2003 in the journal Family & Community Health, found that a mindfulness-based stress reduction program may help to reduce anxiety symptoms. If you suffer from either of these debilitating mental conditions, making a point to regularly practice meditation can be a powerful step on your way to relief. The more you meditate, the more in control of your depression or anxiety you may feel. Research has shown that meditation can help to combat insomnia and promote restful sleep. It can also improve the quality of your sleep, ensuring that you are well rested. If you consistently get a good night’s sleep, you will find your mood significantly improving. As sleep is important to all functions of our bodies and minds, including our moods and neurotransmitter levels, making sure you get at least seven hours every night is key. Regular meditation is one way to help make that happen. So, if you want to get happy, start meditating today — and stick with it!